Our central Burnaby office has many solutions to your oral care needs ranging from General to Restorative to Cosmetic Dentistry. We have a professional dental care team that strives to provide excellent customer care experience. Whether you’re in need of orthodontics, dental implants, or a root canal, you can trust that we are the right team for you. 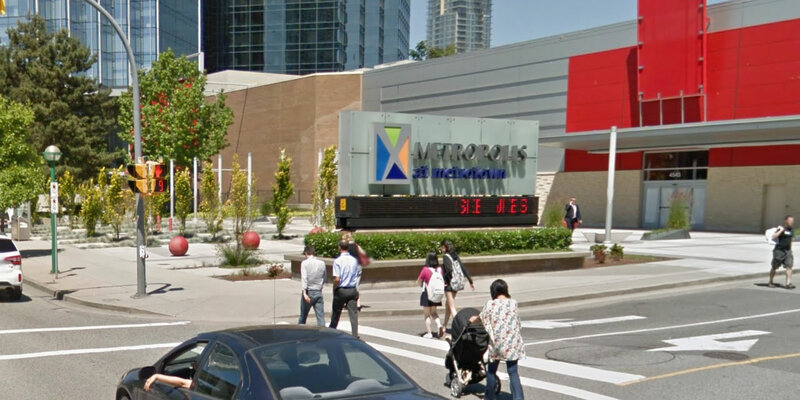 Mega Dental is located in Metropolis at Metrotown on the Lower Level and P1 where there is plenty of free parking. The Central Boulevard entrance is the closest entrance to us. If you prefer public transit, there is a Skytrain station and TransLink Bus Loop that directly connects to the mall, making our location accessible from almost anywhere. Come visit our Burnaby location today. Dr. Henry Chang received his Doctor of Dental Surgery degree from the University of Alberta in 2006. He then completed one year in the Advanced Education in General Dentistry program in Massachusetts at Boston University. He has the ability to work in all aspects of general dentistry including quality restoration of teeth & full mouth reconstruction (mercury-free fillings, crowns, bridges, implants, conventional removable dentures, implant-supported dentures etc.). Dr. Chang also performs root canal therapy, periodontal therapy, laser dentistry, and oral surgery procedures including crown lengthening procedure, open flap debridement, as well as wisdom teeth extraction. He is happy to help you in English, Cantonese and Mandarin. Dr. Suzanne Ting graduated from UBC with a BSc degree in Biochemistry. She obtained her Doctor of Dental Surgery degree at the University of Alberta in 2000 and received advanced dental training at Las Vegas Institute and Renaissance Dental & Implant Institute. Dr. Ting practices the full spectrum of general dentistry including root canal therapy and oral surgery procedures with a focus on cosmetic and comprehensive restorative dental care such as teeth whitening, mercury-free fillings, veneers, crowns, bridges, dentures, and implants. She has been providing orthodontic treatment since 2001. As Invisalign Preferred Provider, Dr. Ting has extensive experience in Invisalign clear aligners since 2004. She is a dentist with a strong commitment to professional excellence and is actively involved in multiple study clubs for continuing education. Dr. Ting is known to her patients as a gentle, caring, and compassionate dentist, dedicated to providing her patients with a pleasant dental experience. She is fluent in English, Mandarin, Cantonese, and Foochow. Dr. Wise Tang was born and raised in Hong Kong and moved to Canada in 1993. She finished her undergraduate program in 1996 and graduated in the Doctor of Dental Surgery program with honours at the University of Toronto in 1999. She has been practicing general dentistry in lower mainland for over 15 years and has taken numerous post graduate courses in Oral Surgery, Endodontics, Cosmetic Dentistry, and Orthodontics including Invisalign. She enjoys treating children and promotes prevention in their early age. She has great passion for dentistry and can create truly beautiful smile with the latest in technology. She is competent in all aspects of dentistry such as mercury-free restoration, root canal therapy, denture, extraction, teeth whitening, invisalign, gum surgery, crown and bridge. She is happy to help you in English, Cantonese and Mandarin. I had a positive good experience with Dr Chang and their hygienist, Linda; as well as their receptionist, Theresa. The entire team is very professional, their service quality is excellent and exceed my expectation. Whenever I have questions to ask, Dr Chang always answers my questions thoroughly. He is very knowledgeable and professional. Been to this dental location for a very long time, the time when it was the previous dental office, I getting my teeth done here. I always enjoyed the convenience of being able to park my car under covered parking, go shopping inside the mall then get my teeth cleaned. All staff should speak English first, rather than Cantonese or Mandarin but they are all fluent in all tongues. and languages. The reason I come back, mainly because for nostalgia sake and also my hygienist who does an excellent job in cleaning my teeth. Hope that I will be able to have appointments with her for many more years to come. The service at Mega Dental was great today, just like it usually is! The staff is always warm and welcoming. I went in for a teeth cleaning and the dental hygienist was very thorough. I would recommend Mega Dental to friends and family! Great dental office. They treated my 13 year old daughter very well. Can’t say enough good thinks about their entire team. Very professional. Very good experience. Been a client for the past 9 years and would highly recommend this dental office. Front desk staff is super courteous and hospitable. Pleased with the quality of dental care provided through previous extractions, cleanings, and application of braces.